by Michael S. Cole, M.D. 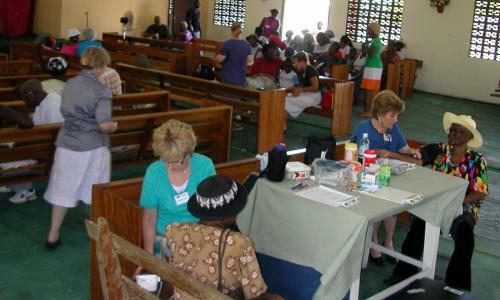 Nineteen Americans worked in Guyana, South America, under the direction of Operation Guyana, conducting a medical clinic for 5 days at Melanie with the assistance of members of the Melanie Church of Christ. One thousand fifty-five patients were examined and treated. 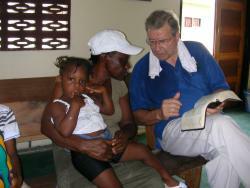 Most patients were taught the Gospel and given religious literature, including many Bibles. 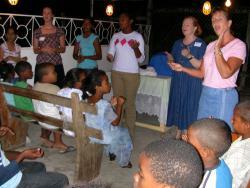 A preaching service was conducted each evening at the clinic site. 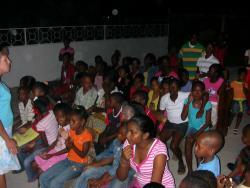 The maximum attendance at the nightly preaching and teaching services was 160. 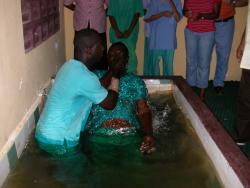 Twenty-four people became new Christians at the village. A detailed account of this mission follows. We started recruiting team members nearly a year in advance of departure for West-Ark's 20th and final annual medical mission to Guyana, South America. Funds were raised; airline tickets were purchased; eyeglasses, medical supplies, and teaching materials were collected; lodging and ground transportation fees were paid; and 2 1/2 months of weekly classes were conducted for Fort Smith area team members. Two days before departure, a newspaper article about West-Ark's work in Guyana since 1991 appeared in the Northwest edition of the Arkansas Democrat-Gazette. On Saturday, 5 June 2010, ten Christian volunteers from West-Ark Church of Christ, two from Roland, and one from Siloam Springs departed with American Airlines from the Fort Smith airport at 6 a.m. We changed planes at the Dallas-Fort Worth airport where we added two more people to the team. At the Miami, Florida, airport the team grew to 18. Our Caribbean Airlines flight departed for Guyana at 4:45 p.m. The plane made a stop in Trinidad while we remained on board. We arrived in Guyana about 10:30, ahead of schedule. The team cleared Immigration, then discovered that all our luggage and supplies arrived with us except for two personal bags. Steve DeLoach, director of Operation Guyana, along with his intern, Rachel Lathrop, Salita, and Ray & Debra Allen met us at the airport. We were transported to the Grand Coastal Inn, arriving after midnight. On Sunday, 6 June, the team ate breakfast together about 8:30. We traveled to the village of Melanie, about 15 minutes east of our hotel. Roy Dunavin taught the adult Sunday School class at Melanie Church of Christ and Steve DeLoach did the preaching. Local church leaders took care of the rest. 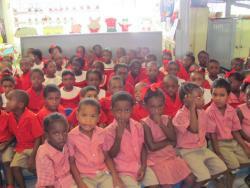 The singing was probably the best we have heard in Guyana. Everyone on the mission team was very impressed with the enthusiasm of the Melanie church members. We found it to be an oppressively hot day. The tropical sun was very bright and there was barely any rain. Even the locals were fanning themselves. We returned to our hotel for lunch about 1 o'clock. The air conditioning at the hotel was an appreciated blessing. We had a rest period till 3:00, then counted and packaged pills till 5:30. We ate supper at 6:30 and then had orientation till about 9 p.m. Everyone had opportunity to get a good night's rest. After breakfast on Monday morning, 7 June 2010, we had a short devotional. We boarded two vans and left the hotel at 10:30. We drove through rain during part of the journey. 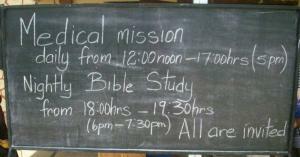 By noon we had our clinic set up in the church building. We provided medical and eye care for 146 patients before we stopped around 5:15. 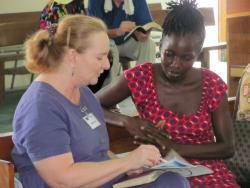 As usual on the first day of our village clinics, the majority of patients were Christians. 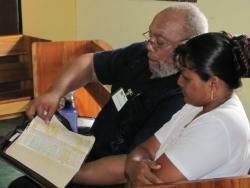 Several local Christians assisted throughout the day with Bible studies or patient flow. 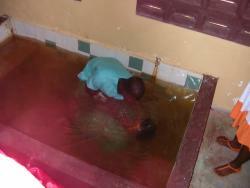 Surprisingly to all, the church's baptistry would not hold water. We were disappointed that no one could be baptized during our first day. We began the evening service with singing about 6:15. Roy Dunavin preached a sermon about Jesus while the children were taught a lesson about Creation. We were back at the hotel for supper by 7:45. On Tuesday, 8 June, we had our clinic operational by 11:30. We treated 173 patients by 5:30. 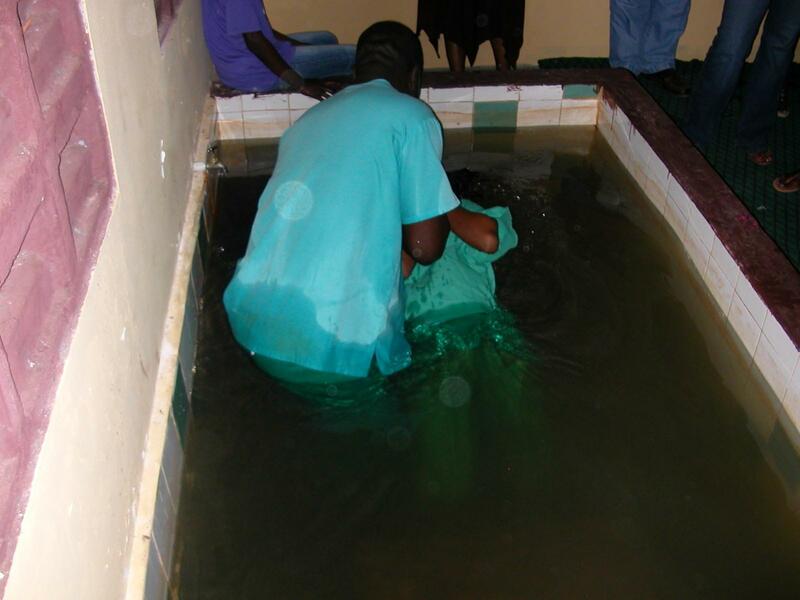 The baptistry leak had been fixed and 8 people were baptized following Bible studies. The temperature peaked at 90°F around 3 p.m. Even the Guyanese commented that it was hotter than normal. We think it was the hottest day we had experienced in the 20 clinics that we had held in the country since 1991. The lack of rain during the day allowed the temperature to stay higher than usual. Team members were drinking lots of water to avoid dehydration, but the heat was adding to our fatigue at the end of the day. After the evening service we eagerly returned to our cooler hotel accommodations. On Wednesday, 9 June, we ate breakfast, had our morning devotional, and left for Melanie about 10:30. It rained most of the distance to the clinic site, but we had no more showers during our clinic hours on Wednesday. When we arrived we were very pleased to find that the Melanie Christians had the church building set up with seats and tables almost exactly the way we needed everything arranged. We were able to open the clinic a few minutes past 11, giving us over 6 hours to see patients. When patients arrived at our make-shift clinic, they were given a numbered ticket by our gatekeeper. Next, patients were given a form that was gradually filled in by several people before they left. First a local woman wrote the patient's name and address. Then the patient was sent to a waiting area. 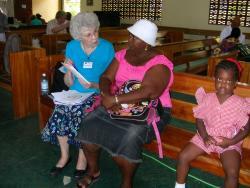 Here patients were offered a personal Bible study by our teachers while they waited for the doctor or eyeglasses specialist. Most people sat for the study. Every person was treated with the same kindness and respect regardless of their willingness to discuss the Bible. Before seeing one of our physicians, patients' vital signs were checked and their health concerns were recorded by one of our nurses. The clinic forms were completed by the doctors and 108 patients (on Wednesday) were sent to our pharmacy where medications were distributed free of charge. 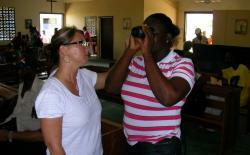 There were 126 patients who had their eyes checked by Missy Blasdel and her crew. Eyeglasses were distributed to people at no cost. Many had their vision restored. Before leaving, all patients were given a tract, "God's Plan for Saving Us from Death," written by Dr. Cole. There were many Bibles and other religious materials distributed by our Bible teachers. Children were typically given a coloring book page and crayons while a parent listened to the Lord's plan of salvation. The gate was closed at 5:10 and the clinic was concluded about 5:45 p.m. The clinic area was rearranged for the evening service. Being a Wednesday evening, there were several of our friends in attendance from other congregations. Beginning about 6:30, Melanie's song leader Kelvin led us in several songs, most of which were known to the Americans. Beginning about 7 p.m., Roy Dunavin preached on the second coming of Jesus for about 40 minutes. 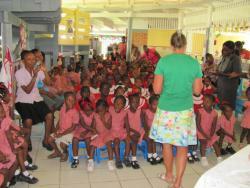 Jeannie Cole and others taught 43 children under an outside covered area during the sermon. We were back at our hotel for supper by 8:00. On Thursday morning, 10 June, we ate breakfast, had a devotional, listened to Steve's announcements, took a group photo, and then left for Melanie at 10:30. 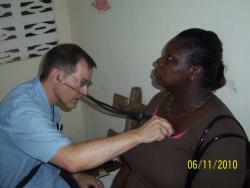 We quickly set up the clinic and began Bible studies and treating patients for vision or health problems. 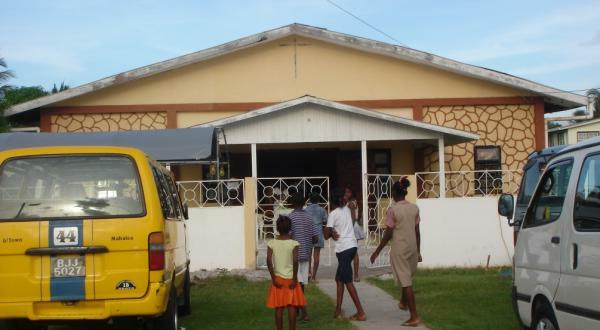 Immediately upon arriving at the clinic site, 4 of our women were driven to a nearby preschool. There they taught a Bible lesson on Daniel to one hundred seventy-nine 3-, 4-, and 5-year-old children. This left us short on Bible teachers in the clinic for about half an hour. Shortly after the ladies returned, 5 students from the Guyana School of Biblical Studies came to assist with Bible teaching. We were pleasantly surprised that one of the students was Amanda Mattai from Canal Number Two, who worked with us (as a teenager) at our clinic in 2009. It was again 90°F on Thursday, but more tolerable as we were becoming more accustomed to the heat. We saw 278 patients before we shut down the clinic. Five chose to be baptized. Kelvin, Melanie's song leader, led us in songs for about half an hour, then the children were called out to Bible class and Roy preached an "Introduction to the Bible." 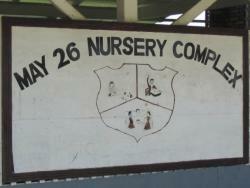 The children's class was done near the front gate. 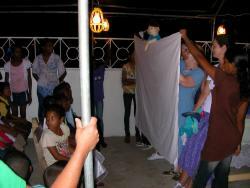 The kids sang, heard Bible stories, watched a puppet show, and saw a dramatic presentation of the "Good Samaritan." At our hotel about 8 a.m. on Friday, 11 June, our physicians met with Kencil Banwarie, a linguist and professor at the University of Guyana, and his wife. He had many excellent questions about how we compensate for the differences between American and Guyanese dialects as we examine, diagnose, and treat patients during the 20 years that we have worked in Guyana at week-long medical clinics. Mr. Banwarie is planning a book or glossary that will help medical workers to improve the accuracy of communication between health care workers and patients in Guyana. Colleen and Isaiah DeLoach arrived in Guyana from the States on Thursday night and came to eat breakfast with us at the hotel with Steve, Rachel, and the Allens. After breakfast Dr. Younger led our devotional. When we arrived at Melanie there was quite a crowd of people waiting for us. 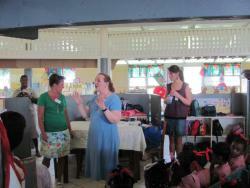 A few of our group went immediately to teach a short Bible lesson at the preschool. We opened the clinic shortly after 11 a.m. 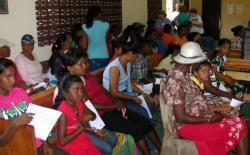 There were considerably more patients asking for eye exams than we could accommodate. Many had to be turned away. We were able to see 106 eye patients while our physicians treated 118 medical patients on Friday. It turned into a very hot day, reaching 92°F. Though we were there during the rainy season, there were no tropical rain showers during our working hours on any of the 5 clinic days. In years past, we appreciated how the brief rains would cool the air for a while. We closed the clinic one hour early to give us time to pack up. A hired truck transported the supplies back to storage for the next team, arriving in two days. Our final evening service began with singing about 6:30. Roy preached on "The Authority of Christ" for about half an hour. We were exhilarated when our mission was completed but saddened to say good-bye to our new Guyanese friends, knowing we will not likely see them again. During our evening meal, Operation Guyana honored West-Ark's 20-year history of sending teams to Guyana with a plaque, guest speaker, and cake. We first received a serving of the scheduled dessert, crunch cake. Being Lesley Russell's birthday, we had birthday cake, too. It was a fun celebration for the mission team. On Saturday, Roy and Joyce chose to spend the day resting at the hotel. Four of our men went on a tour of the capital city, Georgetown, with Sunil, one of our drivers for the week. 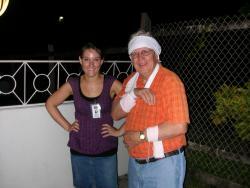 The rest of the team, including Operation Guyana's summer intern, Rachel Lathrop, were picked up at the hotel at 8 a.m. The 13 of us were transported the short distance to Ogle Airport in Georgetown. We were all weighed individually before boarding a small plane. We departed about 9:00. We flew deep into the tropical rainforest, over rivers and trees. 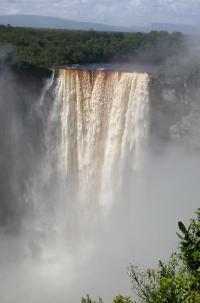 About 10:00 we landed near the top of Kaieteur Falls, the highest single drop falls in the world. At 741 feet, it is five times higher than Niagara. A guide led us on a hike through the rainforest. We stopped at several photographic spots and snapped lots of pictures of this beautiful waterfall. Surrounded by a national park, it has been left totally in its natural setting, with no guard rails or commercialization. Most of us caught a glimpse of the inch-long Golden Frog that lives only near Kaieteur. Lunch was served as a rather elaborate picnic. We ate chicken, vegetable rice, pasta salad, vegetable salad, watermelon, pineapple, Pepsi, 7-up, and apple juice. It was delicious. Next we went further into the interior to the border. We flew over mountainous jungle which changed to wide open rolling savannah hills. 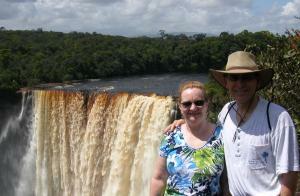 We landed just across the river from Brazil at Orinduik Falls. This wide, multi-layered waterfalls thunders endlessly over shelves of red semi-precious jasper rocks creating fascinating carvings in the river walls. We hiked to the edge of the water below the falls and took some awesome photos. It was a hot day in the tropical sun. We were glad to be back in our air-conditioned plane heading back to Georgetown at 2 p.m. We were back in our hotel rooms about 3:30. Supper was served at 6 o'clock. We placed our suitcases outside our hotel rooms by 8 p.m. to be loaded on the truck for transport to the airport. On Sunday, 13 June 2010, the team met for Communion at 1:45. At 2 a.m. we left on the 50-minute ride to the airport. We were quite surprised that the airline singled out our team to board early. Though our flight number was the same from Guyana to Miami, in Trinadad we had to change planes, which meant again going through security before boarding. We were fed a hot breakfast on the flight. We arrived in Miami on time, caught our connecting flight through Dallas, and returned to Fort Smith by 10 p.m. It is always a joy to be welcomed home at the airport by friends and family. 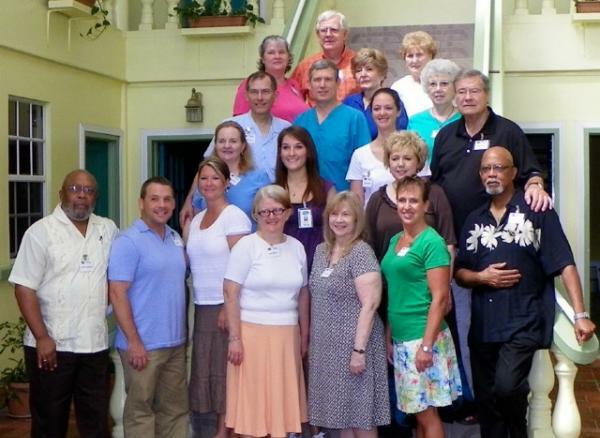 And so ends 20 years of annual medical mission trips to Guyana, South America. There have been 159 West-Ark members who served in Guyana, and we lost count of how many Christians from other churches served on our mission teams. 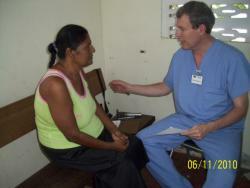 We provided health care for 26,953 patients. 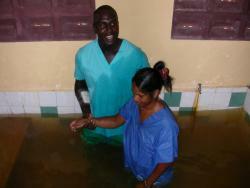 Our Bible studies resulted in 815 baptisms during the 20 weeks that we served in Guyana. We very much appreciate all those who have been involved in this work in so many different ways. Countless lives have been changed for the better – physically and spiritually. Many Christians – Americans and Guyanese – have become (or are becoming) spiritual champions through this ministry of West-Ark Church of Christ. May God's purposes continue to be honored and His Son be praised. Sandra Anderson, Missy Blasdel, L.P.N., Jeannie Cole, Michael Cole, M.D., Joyce Dunavin, R.N., Roy Dunavin, Dolton Duplechan, Rebecca Evans, Jim Hardin, Jim Harris, Connie Hixson, Nancy James, Rachel Lathrop (intern), Mary June Lewis, R.N., Lesley Russell, Mary Jo Russell, Niketa Stinchcomb, Rusty Wilson, R.N., Steven Younger, M.D.